Starting an eCommerce business is like an auction. To get the success you need to compete with the industry leaders to mark your place in the race. In order to that, the presentation of your website is the first thing you need to work on. As customers notice it at their first glance. And when the look and feel of your e-store go right with the customer flow, you are sure to achieve your target numbers. When I see people kick-starting their eCommerce business, the first thing they look up to is the platform. And I must say that apart from the industry giants like Magento and Shopify, Odoo is a platform that has become the first choice of new adopters. But things get overwhelming when it comes to choosing a theme. You have to be particular about the choice you make. After all your website theme represents your style. About the fonts, color combinations and all other small details, you have to keep a crystal clear view from your side. When you have an eCommerce store, you want to make sure that it’s visible in the search engines. Especially, when Google is ruling the web, the first thing you need to focus on is the mobile-friendliness of your website. And Crafito theme supports multi-device design approach which makes it compatible with all screen sizes. The development of is a dynamic process. Because every entrepreneur in the market has different purposes for their businesses. Be it an affiliate store, one-page website, or a most complex ecommerce website, this theme suits all types of needs. Crafito theme comes with unique design options which suit any industry type. You can choose this theme for your website to pull out the desired layouts. When you have your e-store built with Odoo, the Kingfisher Theme fits the best in place. As this theme has specially crafted keeping all the industry demands in mind, it fulfills all the requirements from developers to an individual user’s point of view. When a website responds slowly, visitors don’t spend much time there. Optimized speed is one of the most important components of any website. This theme ensures the high website speed so that you can make sure that your website works smoothly and generate expected results. The key benefit of this theme is that it’s multipurpose and has built using HTML5 and CSS3. So, you have a lump of clay which can be shaped into any form of your choice. With this theme, your backend looks pretty and more organized. You can easily manage the backend of your e-store with its impeccable viewing facility. 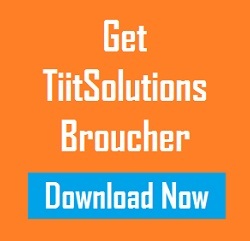 It is important to understand that customization is necessary. There will be times when you need to customize the sections of your e-store. This Odoo backend theme comes with some amazing customization functionalities. So, you can customize the backend the way you want. Yes! A backend theme compatible with Mobile devices. With the Falcon material backend theme, you will be able to manage your backend at anywhere anytime. This Odoo Ecommerce theme is specially built for eCommerce stores that offer mobiles and other gadgets. Based on HTML5 and bootstrap, this Odoo theme is a bestselling mobile theme among its competitors. Here are some of its features. To give a rich and exclusive feel to your e-store, banner sliders are one of the most impactable ways. And with this theme, you get the brand slider snipper display. This way, you can highlight the most engaging brands. You can even customize the banner and images. There are many users out there who constantly look for a theme which supports multi-store. This way, you can add multiple languages and currencies accordingly. 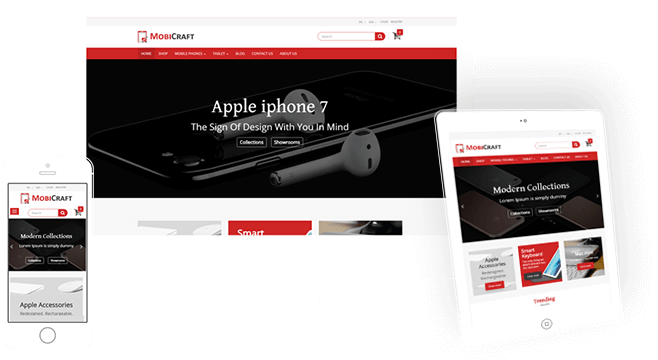 With the Mobicraft theme, you get the facility to manage multiple stores. Based on Admin’s requirements, this theme has the facility to configure store shop. You can add or remove the required components with the help of this Odoo ecommerce theme for the mobile website. In the fashion industry, customizations are more frequent than any other industry. This theme lets you customize the Odoo ecommerce theme the way you want. You can easily change the color combinations, layout, and fonts of the theme. While shopping, sometimes it’s never satisfying no matter for how many times we see, try on the clothes. Therefore, when you offer online buying options, it is important to provide an insightful view of your products. With this theme, a user can see the back side of the product as well by hovering over the image. You can add a snippet to your eCommerce store which contains exclusive products from the product list. Your customers can add product directly to the cart. Additionally, they can see the rating of the related product. Apart from the above-listed features, there are other features available for these themes that may fulfill the gap of requirements for your eCommerce store. While choosing a right kind of theme from thousands of available Odoo themes out there, it’s you to decide the final choice. The major focus is to make sure that the theme is responsive, optimized for speed, and customizable. The above Odoo Ecommerce themes have their own set of specialties. All with a premium look and features that an ideal theme should have. Now, the choice is yours! Streamline your eCommerce requirements to choose your Odoo Ecommerce theme. About Maulik Shah is the Founder and CEO of AppJetty, a fast growing software add-on store selling Odoo apps and themes. 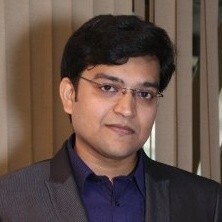 Maulik is a tech enthusiast and writes about the various aspects of ecommerce technology.